BOSTON – Four questions. Four cups of wine. Four types of children. At Passover, the number four figures prominently in the rituals of the seder, the ceremonial holiday meal that can be mesmerizing and mystifying. The youngest kids and their grown-up readers will want to join Grover, Big Bird and their “Sesame Street” friends at Avigail’s Passover seder to eat matzah, read the haggadah and ask the Four Questions. Cookie Monster can come along, too – but only if he eats special Passover cookies. 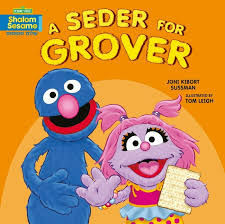 Grover tells his friends it’s good to invite guests to the seder. Even Moishe Oofnik the grouch is included. Marcy is the youngest child in the family who just learned to read, and it’s her turn to ask the Four Questions. But Marcy’s older brother, Jake, isn’t so happy to relinquish the ritual that has won him plenty of praise from his relatives. Marcy, a vivacious and inquisitive girl, turns down all offers of help to practice reciting the Four Questions. Older kids may figure out that Marcy doesn’t realize she’s expected to read the traditional questions from the haggadah. She’s come up with her own questions all by herself. Here’s one: How many matzah balls in Grandma’s chicken soup? Read to see how the family and Jake react. This year, the Winklers have stored their matzah in a tightly sealed tin box and Miriam Mouse hasn’t been able to find any stray pieces – not even crumbs – for her family’s holiday. When the determined Miriam crawls through her hole, she spies Eli’s father hiding the afikomen, the piece of matzah needed to conclude the seder meal. Who will find the hidden matzah first, Eli or Miriam Mouse? Kids will delight when Miriam Mouse finds the perfect solution for both families. Shimri learns that King Hezekiah is looking for ideas on how to bring water inside the city’s walls and wonders if the king will listen to a small boy’s solution to the problem. Weber’s timeless, folk-style tale will strike a chord for young readers who will share Shimri’s frustration.